A llama, traditional woven fabrics, the Andes, the silhouette of a pan flute player… Trader Joe’s is really going all out for the “Peruvian” theme. Reviewing Trader Joe’s peculiar partially popped popcorn snack the other day got me to thinking. The highest praise I had for those little half-formed kernels was that they were like Trader Joe’s own off-brand of Corn Nuts. 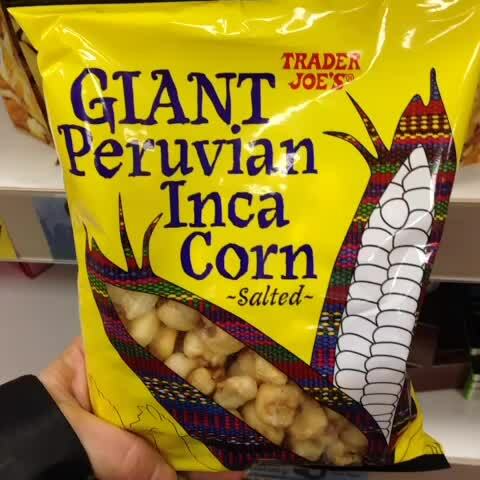 Then I remembered, Trader Joe’s already has its own off brand of corn nuts – in Trader Joe’s Giant Peruvian Inca Corn! The phrase “giant Peruvian corn” might conjure up all sorts of images for you – enormous Peruvians tending their stepped maize fields with a tender prod of the forefingers, perhaps. What it actually means in this context is a bright yellow bag of very large corn kernels that have been fried up until hard, then robustly salted. The result is something more or less exactly like the American snack food stable Corn Nuts – almost too hard, brittle, and incredibly crunchy kernels of puffed up corn primarily used as a salt delivery system for the snack prone. The taste is practically the same as well – roasted, toasted, nutty and only ever so slightly corn-y in the after taste. The biggest difference between the branded variety and Trader Joe’s version is also the most obvious – these kernels are gigantic! Although the center of each roasted kernel is hollow, these roasted corn snacks are still alarming gigantic – chewing on even two or three at a time is a serious undertaking. Munching on these is like smoking a cigar to Corn Nuts’ cigarette – it’s simply scaled up the whole affair to a daunting level. There’s no hidden trick to Trader Joe’s giant Inca Corn, they simply went to the source. Peruvians have been growing a giant form of corn, known as choclo or simply Cuzco corn, since time immemorial. In addition to being oversized, the corn is known for being chewier, nuttier and less sweet than other types of sweet corn. The staple crop has long been served up in restaurants across Peru and the surrounding areas in this very form – fried, salted and served hot. As long as you’re down with the Plain version of Corn Nuts, I found Trader Joe’s Giant Peruvian Inca Corn a perfectly acceptable substitute. In fact, the giant size makes them even more filling, and slightly less impulsively snackable, than the mainstream variety. Trader Joe’s Partially Popped Popcorn might taste about the same, and be less hard on the ol’ chompers, but in my book whole, hard, fried corn kernels is just a classic snack. Would I Recommend Them: If you like Corn Nuts, you’ll like these. Would I Buy Them Again: It’s a lot of carbs, but I’ll definitely be tempted to. Final Synopsis: Big ol’ Corn Nuts with old school roots. I could not stop eating these. Maybe because the kernels are bigger, I found them crunchier and cornier (??) than Corn Nuts, which I’ve always loved. I’m honestly afraid to buy another bag – the first was gone in 2 days. have a nice day speak to you soon . I’ve read good things about these in the TJ’s Facebook Community Group I’m in. So I will definitely try them, as I do really like corn nuts! The best snack ! It last hours.you can munch and munch this delicious corn and be satisfied with maybe 6 or 8! These things are too crunchy. Had a bag last week and my jaw is still sore when I eat. are they still available at TJ’s? I’ve got a bag in front of me. The info above is incorrect. Cholesterol is 0mg, not 300. 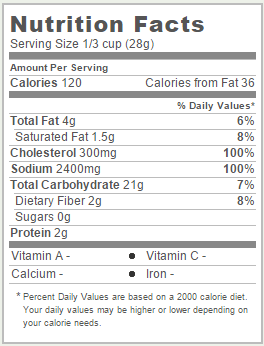 Sodium is 130 mg (5% of Daily Value), not 2400.